Clive is one of the western suburbs of Des Moines. The city of Clive spans across Polk and Dallas Counties in Iowa It was plotted in 1882 but did not incorporate as a city until 1956. In its earliest days, Clive was a coal mining town in a railroad shipping point along the St. Louis Des Moines Northern Railway. The railroad depot which dates back from 1882 has been restored and the neighboring Swanson House dating back from 1911 serves as a headquarters for the Clive historical society. Learn more about the city of Clive. 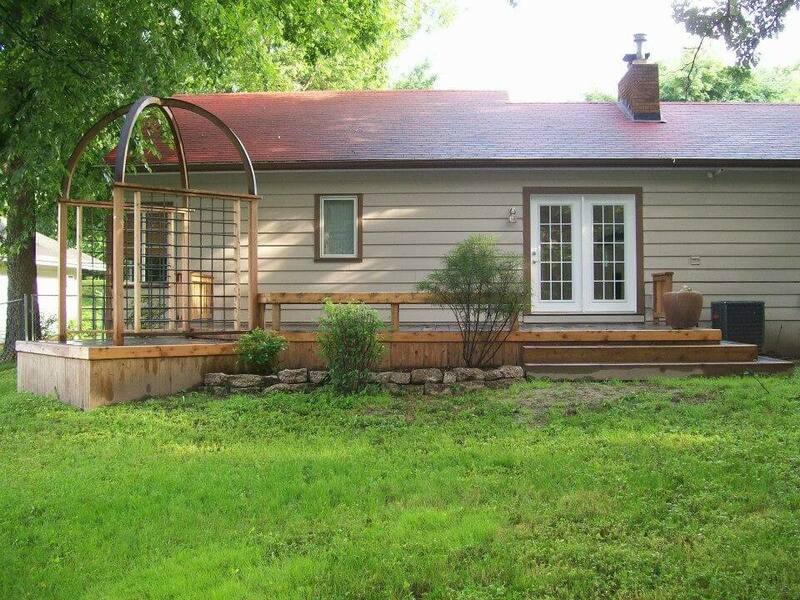 Compassion builders constructed the deck in the above photo for a client in Clive Iowa. This deck is a mix of a Trex composite decking and cedar. Hidden fasteners were used on the flooring for a clean look. The section to the left of the photo was stepped down to keep the elevation low to the ground making a railing unnecessary. It was topped with this beautiful radius topped cedar and copper pergola for an intimate seating area. We removed a window from the house and added the door for easy access. Everything was Followed up with a fresh coat of paint and new gutters in this exterior remodel. Let Compassion Builders be your contractor of choice for all of your Custom home and basement finishing and remodeling needs. Jonathan and his crew recently completed some remodeling at my house and installed some new doors. From the initial consultation, installation and finalization; I was kept informed of the job status. Everything was completed in a timely and professional manner at a very fair price. I would highly recommend Compassion Builders to everyone.